Born and educated in Ireland, Max Arthur Macauliffe (1841-1913) joined the Indian Civil Service in 1862. In 1882 he was promoted to the post of deputy commissioner of the Punjab. But it was after he retired from the civil service in 1893 that he gained public attention. Macauliffe developed a close affinity with Sikhism while in the Punjab, eventually converting to the religion. His translation into English of the Guru Granth Sahib, the holy book of Sikhism, is recognised as the most accurate to date. Following this project, he set to work on this six-volume set, covering the history and philosophy of Sikhism, first published in 1909 and still regarded as the definitive work on the subject. 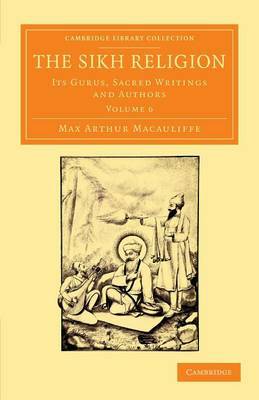 Volume 6 covers the lives of the Hindu and Muslim saints whose compositions are included in the Sikh holy book. Translations of these compositions are also provided.